4 Bedroom Detached House For Sale in Huntingdon for Offers in excess of £300,000. 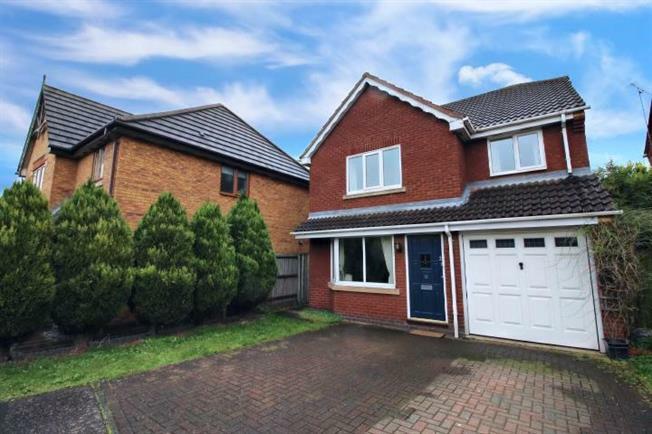 Taylors Estate Agents are delighted to offer for sale a four bedroom detached family home located on Greendale, Stukeley Meadows, Huntingdon. The property comprises of entrance hall, lounge, dining room, kitchen, utility area and WC to the ground floor. First floor comprises of four bedrooms (master bedroom with en-suite) and three piece family bathroom. Outside boasts front garden and driveway with enclosed rear garden. Huntingdon is a historic market town located on the main banks of the Great River Ouse and boasts immediate main-line access to London and the North. Huntingdon is situated just off the A1 and A14 with access to several trunk road network. Huntingdon offers a variety of High street shops, churches, schools, recreational facilities and other amenities. Accessed via the main front door leading to the entrance lobby. Laminate flooring.. Further doorway leading to the lounge. Sliding patio doors leading into the rear garden. Further doorway to the side leading to the Kitchen. Double radiator. Window to the rear overlooking the garden. Wall and base units. Inset 4 burner gas hob with an extractor fan over and an electric oven. Integrated dishwasher 1/1/2 bowl single drainer sink unit with mixer taps. Space for a fridge and freezer. Door way leading to the utility room. Door to the side leading to the exterior and further doorway leading to the cloakroom. Further range of wall and base units with complimentary work surfaces over. Inset single drainer stainless steel sink unit with storage under. Space for a washing machine and tumble drier. Low level WC. Wall mounted wash hand basin. Radiator. Window to the front. Radiator. Inset ceiling light's. Doorway leading to the En suite. Window to the side. Single walk in shower cubicle. Low level WC. Sink inset in a vanity unit with storage under. Electric shaver point. Window to the rear overlooking the garden. Radiator. Coved ceiling. Window to the rear overlooking the garden. Radiator, Telephone point and laminated flooring. Paved patio area with a low wall boundary, leading to the main lawn area. Space for a garden shed and side pedestrian access.